In the digital age, there is sometimes still a need to use paper documents for interacting with your customers. Because this results in a large buildup of paper, shredding often becomes a necessity. There are strict laws in place which require you to destroy client data, transactions or other sensitive information after a certain amount of time. These documents should always be handled and destroyed properly to prevent any information leaks and identity theft. PRODUCTIVITY: Using a third-party to handle the shredding process on site helps maintain your company’s productivity. There is no need to burden your staff with in-house shredding, compiling and transferring documents into bins and ultimately in small shredders which cannot handle high volumes. When you have mobile shredding services come to your door, your employees won’t have to stop their focus on the daily workload. CONVENIENCE & COMPLIANCE: A mobile shredding truck will come to your office and shred your documents efficiently on site. They will also transport the remaining paper waste to be recycled. 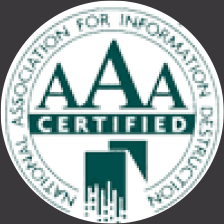 Shredding of personal information keeps a company compliant with state and federal regulations about how to destroy or handle personal information. SAVING THE ENVIRONMENT: Paper still has an extremely high usage in daily business. Mobile shredding services are 10x more efficient than doing it the old-fashioned way. The shredding trucks have advanced equipment which handle huge volumes of paper in a short amount of time. Shredding and recycling protects more trees from being cut down and keeps landfills from not filling up as fast. SAFETY OF SENSITIVE INFORMATION: Mobile shredding trucks can instantly eliminate the risk of information being reconstructed. Right before your eyes it’s securely destroyed and the truck will provide documentation for every shred they do. 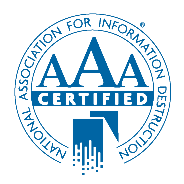 THIRD-PARTY CONFIRMATION: Using IntelliShred service serves as independent confirmation that all your confidential documents are destroyed in accordance with company and federal privacy laws. 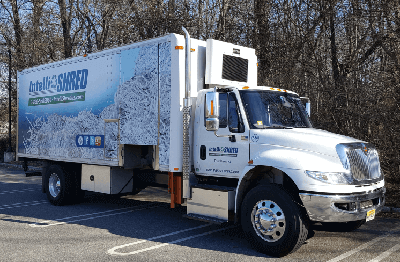 Intellishred’s mobile shredding services have been helping customers destroy and recycle paper, floppy drives, CD’s and DVD’s, Video Cassettes, Microfilm, Microfiche and more. Contact us today and let us help you purge your business materials.